Copyright �2004 PopEntertainment.com. All rights reserved. Posted: July 29, 2004. Sometimes, through a mixture of hard work, talent and sheer luck, a movie just clicks. Everything works. The 1995 romantic comedy/drama Before Sunrise was one of those films. It stood out from the pack of the Gen X films of the time, because it was smart, funny and had a serious point of view. It was light on its feet and yet asked big questions about life and love. It was deeply philosophical but never seemed preachy. The film was loosely based on a true story from the life of writer/director Richard Linklater. As a young man he met a girl while traveling in Europe and had always wondered what might have happened had they stayed in touch. By 1995, Linklater had become a voice to be heard in independent film circles. His debut film, Slacker, was made on a shoestring and became a surprise success. His second movie, Dazed and Confused, became the American Graffiti of the nineties, introducing such future stars as Ben Affleck, Michael McConaughey, Renee Zellweger, Rory Cochrane, Milla Jovovich and Parker Posey. Vying for the male lead was Ethan Hawke, a young actor who was creating a buzz in films like The Dead Poets Society, Alive and Reality Bites. Julie Delpy was up for the female role. She was a young French actress who came from a theatrical family. She had been working since she was fourteen. Delpy was in respected European films like Krzysztof Kieslowski�s White (part of the director�s acclaimed Red, White and Blue trilogy) and Agnieszka Holland�s Holocaust drama Europa Europa. Delpy had just recently dipped her toe into the Hollywood system. She played a supporting role in the 1993 big-budget adaptation of The Three Musketeers with Charlie Sheen, Kiefer Sutherland and Chris O�Donnell. Then she starred in Killing Zo�, one of the better Tarantino wannabes that was released in the wake of Pulp Fiction. In the film, Hawke plays Jesse, an American who is traveling in Europe. He meets Celine, a beautiful French girl, on the train. They start to talk, and then he convinces her to join him in Vienna. He has a plane to catch to the United States first thing the next morning. So the two spend the night walking around Vienna, exploring the city and each other. They talk about their lives, hopes and loves. Over the course of the night, the two fall in love. However, in a na�ve leap of faith for romantic destiny, instead of trading contact information, the couple just agrees to meet back in Vienna six months later. In 1995, Before Sunrise opened to rapturous reviews. It did well in the theaters it played in, though it mostly was shown in art theaters and never got as wide a release as many blockbusters. Then a whole new crop of people discovered it when the film became a hit on video. After Before Sunrise, there were expectations that Delpy would become a star, but they never came to be. Soon she was stuck in bad Hollywood fare like An American Werewolf In Paris or smaller, arty films like The Passion of Ayn Rand. In 2001, she even did a brief stint on ER, which was the most popular show on American television at the time. In recent years, she has naturally started gravitating towards home. �I wouldn�t say it was the difference between European and American [filmmaking]. I�d say it�s the difference between Hollywood films and independent films and European films,� Delpy says. �I think European films and independent movies are very much alike� the same process. Hollywood films are another story. Too many people involved, and too much money and all that. 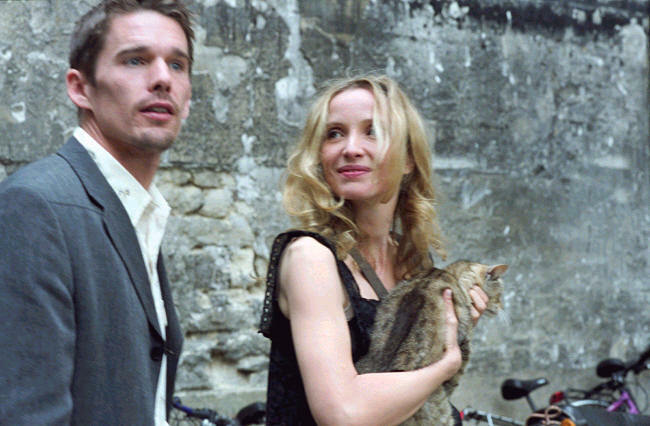 Before Sunrise was not the type of movie for which the world expected to see a follow-up. It was nine-years old, too small, too talky and too artistic. It made a decent amount of money, but it was no blockbuster. Before Sunset has come to be, mostly due to the passionate determination of the three collaborators. Also, helping was the fact that Linklater had a little more power in Hollywood after his 2003 comedy School of Rock, starring Jack Black, became a smash hit. Therefore the money men were a little more open to funding the trio's labor of love. In the new film, nine years have passed. Celine and Jesse never met in Vienna six months later. Jesse has written a book, a fictionalized version of the couple�s magical night. It has become a bestseller� a tiny bestseller, Jesse insists. He is doing a reading at Shakespeare & Co., the biggest English language bookstore in Paris, on the final stop of his European book tour. Suddenly he looks up and sees Celine. She lives locally and had seen that he would be appearing. After nine years of not seeing each other, they have a lot of catching up to do. Each has spent the last decade wondering if the other wasn�t the one that got away. Once again they are racing against the clock. Jesse has to leave for the airport in an hour and a half. The two walk and talk and try to figure out if they still have that connection, or if they had romanticized their night together to a point that no one could live up to it. At first the conversation is a bit awkward, but soon they are back in rhythm with each other. They start opening up about their lives and beliefs and disappointments. As they circle closer and closer to each other, emotions get raw. They find out tantalizing facts of their pasts, including the fact that for a while they both lived in New York City at the same time. In fact, on his way to his own wedding, Jesse was sure that he saw Celine entering a deli on Thirteenth and Broadway. He had always chalked it up to pre-marriage jitters or wishful thinking. It turns out that at the time, Celine was living at Eleventh and Broadway. Jesse opens up about how disconnected he feels from his wife. He says he feels like he is running a nursery with an old girlfriend. Celine acknowledges that she has a tendency to date men that she can keep emotionally distant. Unlike most sequels, the characters have definitely grown and changed significantly. In fact, in the original film, Jesse was more cynical about love, while Celine was something of a romantic. Now, Jesse is stuck in a loveless marriage, but because of his devotion to his son and his true respect for his wife, he seems less jaded than Celine, who has dated a long line of men that were wrong for her. Obviously having written the character, Delpy feels a great deal of empathy for Celine. Still, she feels it�s too simple for people to assume that she based the role on her own experiences. The film is filmed in long continuous takes in real time, making it feel like we are eavesdropping on this pair as they rediscover something that they have lost. The conversation flows naturally and spontaneously, flitting off in different directions at a moment�s notice. However, this sense of realism was the product of a great deal of hard work and planning. It may seem like the dialogue was off the cuff and ad-libbed, but nothing could be further from the truth. All of this is done with the backdrop of Paris, the gorgeous gardens, the quaint shops, the old neighborhoods and the majestic Seine River. The city is very much a character in the film, just as Vienna had been in the first film. However working amidst these beautiful surroundings didn�t overwhelm Delpy. In many ways the new film was more immediate than Before Sunrise. The first movie took place over sixteen hours and had the two characters interacting with other people. This film is basically just the two talking in real time. Occasionally they would have to briefly run across other characters, but quickly those people fade back into the background. This was a conscious decision on the part of the filmmakers. Although not many outsiders were brought into the storyline, two of these visitors were very important to Delpy. When Celine and Jesse get back to her apartment, she speaks with two of her neighbors who are having a cookout. Her parents, French actors Albert Delpy and Marie Pillet, play those neighbors. While in Celine�s apartment, she sings him a song called �Waltz For A Night.� Though it sounds like it was written specifically for the film, it actually comes from Delpy�s recent self-titled CD. It was one of three songs from the album that made the soundtrack. Also in the apartment, Jesse put on a CD of "Just In Time" by jazz chanteuse Nina Simone, who had died a few months before filming started. Celine animatedly tells Jesse about seeing her in concert. The scene had a special resonance for the two stars. Much like the first film, Before Sunset ends on a slightly ambiguous note. The audience is left to imagine how this encounter is going to play out. This uncertainty makes the film even more fascinating. For years, ravenous cult fans of Before Sunrise have debated whether or not Celine and Jesse met back in Vienna six months later. Now we know. CLICK HERE TO SEE WHAT JULIE DELPY HAD TO SAY TO US IN 2016! #1 � 2004 Courtesy of Warner Independent Pictures. All rights reserved. #2 � 2004 Courtesy of Warner Independent Pictures. All rights reserved. #3 � 2004 Courtesy of Warner Independent Pictures. All rights reserved. #4 � 2004 Courtesy of Warner Independent Pictures. All rights reserved. #5 � 2004 Courtesy of Warner Independent Pictures. All rights reserved.